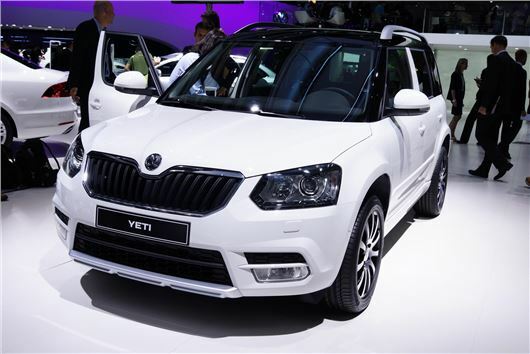 Skoda has launched the revised Yeti at the Frankfurt Motor show. The popular family car gets a new look which sees the inset circular lights at the front disappear in favour of a squarer, more conventional look, echoing the new Octavia. It will go on sale here at the end of 2013. The other big news is the introduction of two versions of the Yeti - one designed for urban driving and another more ruggedly styled model. On the former, shown above, the Yeti gets body coloured bumpers, mouldings, side sills and underbody guards. On the outdoor version they're black plastic, like the original Yeti. At the rear there are changes too with a more angular tailgate design and redesigned light clusters, but aside from that, the rest of the panels remain unchanged, preserving that trademark Yeti look. There are new alloy wheels though with four new designs and more colours with Moon White, Jungle Green, Metal Grey and Magnetic Brown, all metallic finishes. Inside the Yeti gets interior tweaks with a new three-spoke steering wheel, new seat fabrics and extra equipment including, for the first time, an automatic parking system which steers the car into a parallel space while you control the accelerator and brake. Other new features are a double-sided boot liner and a detachable LED light in the boot. The engine line-up remains the same, ranging from the impressive 1.2 TSI with 105PS up to the strong 2.0 TDI with 170PS. The 1.6 TDI Greenline II version emits 119g/km of CO2 and can return 61.4mpg according to the official figures. Updates to the engine range mean the 2.0 TDI 170PS is now available with four-wheel drive and a DSG automatic six-speed gearbox while the 1.6 TDI is now available with a seven-speed DSG. Exact prices and equipment specification for the UK haven't been revealed yet but prices aren't expected to increase too much which should mean a starting price around £15,250.